Virtual Assisting is a broad job title. Essentially it is someone who works remotely to assist a client. How they assist the client can vary from basic data entry, website assistant, answering emails, making phone calls and really- as you can imagine- the list can go on and on. 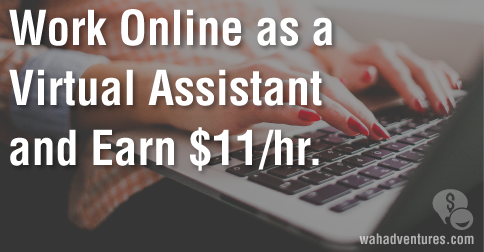 Being a virtual assistant is a great way to take your skill set and make a living online- from home. However, with competition from around the globe and finding many clients are short-term, being a virtual assistant can be a challenge. Welcome Time etc. 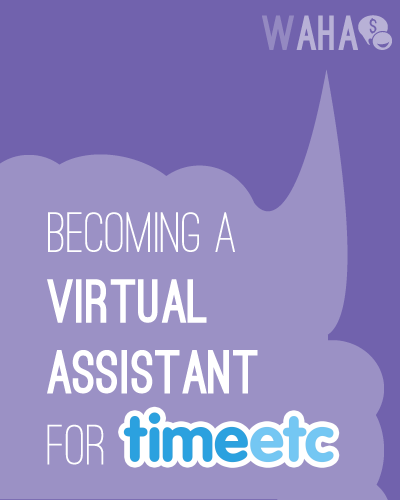 Time etc is an American Virtual Assistant business with 100s of assistants working part time. Working for a company like Time Etc allows you to spend less time searching for clients and proposing bids and more time being paid to work for steady clients. Time Etc has an interesting background with one of their leading virtual assistants having been a personal assistant to Sir Richard Branson for 32 years! That certainly has had to have brought high expectations from clients- which is why Time etc only hires experienced assistants. Additionally, VAs are monitored by project managers to ensure deadlines are met and the quality of work meets expectations. Time etc requires you to be available to work during the work week and would like to get at least 5 hours of work time from you a week. You must be organized and have at least 2 years of commercial experience. Additionally, you will need your home office set up in a quiet environment and have Microsoft Office software and Skype installed on your PC or Mac computer. Pay will vary depending on your skill set and experience. However, once your hourly rate is configured- it will be a guaranteed hourly wage. This job allows you to be paid for your time working rather than per project. On average the pay varies between $11 and $16 per hour. While this is lower than the average VA who works for their own business- working for Time etc eliminates a lot of unpaid working hours by cutting out the job hunting, bidding and so on. Others say they found the pay ends up averaging out to a standard rate once they figure the savings. What Type of Work is Done at Time Etc? If you feel you would be a good fit to the Time Etc workforce then you can apply on their site. You will answer some basic questions and attach a copy of your resume. Time Etc says they verify your educational and work background before completing an interview. Be prepared to have examples of your work to show during your interview. Additionally, to evaluate your skill level, you may be asked to complete skills tests. Good luck if you choose to apply! This is a new one to me! Sounds promising, thanks Miranda! I look forward to sharing this one. Yeah I was pretty excited when I started reading over the website. Seems to be a very good and solid place to work. Looks like a prospering opportunity. I worked with Time Eyc for a little bit and it wasnt such a great experience. I did an article for a blog of a new client and never got paid for it. Never really received jobs and I realized i was better off with my own clients through Elance where there is no shortage of gigs. Thanks for letting us know about your experience with timeetc! That’s very unfortunate. I wonder how often that happens. Karla, would you mind sharing more info regarding the interview/testing process? Kirsten from Time etc here – a colleague and myself personally look after all of our freelancers. I am in direct contact with Karla regarding this issue – we pay all of our virtual assistants by Paypal at the end of each month (and have done since 2007) and I am pleased to report we are in discussions about resolving this oversight promptly. It’s certainly not normal and is a result of an admin oversight rather than intentional! On another point, it’s true to say that the amount of work awarded through our platform varies on many factors and is not guaranteed – however because we pay a fixed, guaranteed hourly rate and you don’t have to bid for work or compete with overseas labor, it can often work out as a great income for our virtual assistants. In the meantime I’m happy to address any questions you may have directly about working with us. Hi Kristen, nice meeting you. I am applying for Time etc. and have not been able to find any reviews from current US workers. Is there any link of site that you can refer me to learn about their experiences? I have a phone interview on Monday with them. I made it through the application and testing. I will let you guys know what I learn on Monday after the interview! HI.. I was just wondering how phone interview went with Time etc? Once you sent them your application, how long was it before they responded and wanted to set up an interview? I applied with Time Etc last month. Took the tests, which included Excel, customer Svc, internet search, Admin Asst, and IQ test. I scored very well. I was even told to create a profile on their website including a photo. Then I heard nothing back. I was disappointed because I scored well and spent time creating a profile. It would have been courteous to at least receive a rejection email. I’m very sorry to hear that we didn’t get back to you! We aim to get back to everyone within 5 days and I’m very sorry to hear that hasn’t been the case for you. If you’re still in working with us I’d love to review your application and move it along? I am working for Time Etc. I find it hard to make money. They send the tasks to many different VA’s. It’s a race for time to accept a task. The tasks aren’t always profitable and may only take 20 minutes to complete. At $11 an hour you have to take on a lot of tasks, if you can get them. I recently went on vacation and changed my availability and now I’m not receiving tasks. When I inquired, I was told it could depend on many factors. I guess going on vacation isn’t allowed. I am currently working on promoting my own VA business to obtain my own clients. I can charge what I am worth and don’t have to worry about being penalized for taking time off. Currently contracting with TimeEtc and I have to say that the clients are a breeze to work with. I have about 5 clients that I work with exclusively, but the work isn’t always consistent. Pay is always available by the 10th of the month and it is via PayPal. The fees that PayPal deducts is a pain, but as a Freelancer, you can claim those fees at tax time. – Communication can be stagnant: because they are in the UK and we’re stateside, there’s no communication should something happen after they close, although they claim to have someone available here in the states to cover. So, if there’s an emergency with a client, you’re short until the next business day. – Don’t hold your breath for a pay increase: it’s been almost 1 year that I’ve been with them, and they have refused to increase my pay from their standard $11/hour. This, although I am constantly receiving rave reviews from both the account managers and the client. There’s no reason given, and the only feedback provided is to read their directive on how to qualify for an increase (which I’ve met) and hopefully it will happen soon. If you decide to work with them, DEFINITELY consider having other options available to you, as I doubt that you could survive with them as your only source of income. This should be updated, as the pay is only $11 flat regardless of experience (they also updated this on their application as well).